Before Christmas the LAMPE team (Déirdre Ní Chróinín and Ciara Griffin, Ireland and Tim Fletcher and Stephanie Beni, Canada.) received some good news that we were awarded €3,300 by the Teaching Council in Ireland as part of their Research Support Framework. 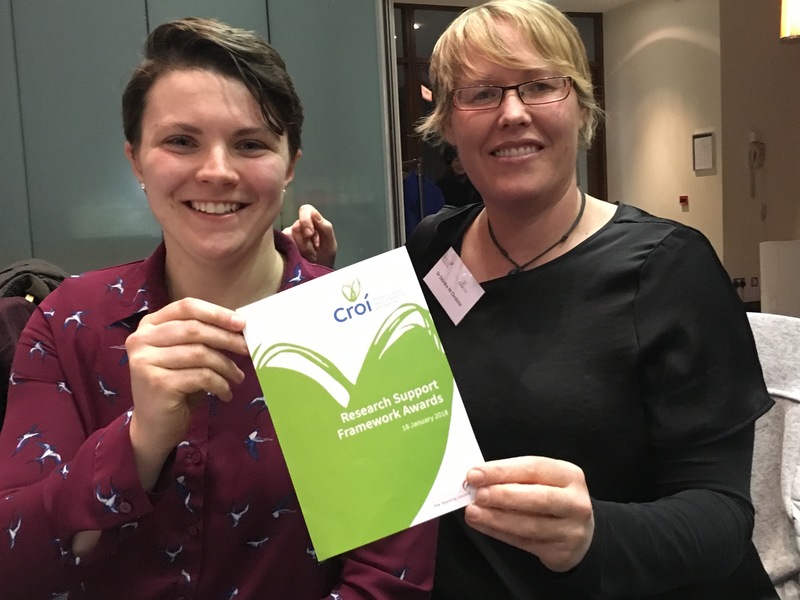 Déirdre Ní Chróinín and Ciara Griffin attended the award ceremony on January 18th 2018 at the Clayton Hotel, Liffey Valley in Dublin. The LAMPE team is delighted to receive this funding which allows us to expand our research programme in primary schools. Why this research? The premise of our application was that promoting personally meaningful engagement is one way that teachers can provide students with transformative experiences that will influence their commitment to lifelong physical activity (Ennis, 2017). Over the past four years we have developed an evidence-based framework of pedagogical principles and strategies that help teachers to foster personally meaningful experiences for young people in primary physical education (PE). We call this innovation ‘meaningful PE’ (MPE). The MPE framework is built on the following features: social interaction, fun, challenge, motor skill learning, delight and personally relevant learning. This research will provide new insight into how teachers can use these features to promote meaningful physical activity experiences for children in physical education. What will we do? This research will provide an opportunity for five primary teachers from the Munster region to work together in a community of practice to try out the MPE framework of pedagogies and share the experiences of children in their classes. Goal-setting and reflection processes will help the children to make sense of their physical activity experiences grounded in personal and everyday realities (Ennis, 2013). The teachers will complete a reflective diary entry each week about their teaching and the children will complete a workbook about their learning in lessons. A member of the research team will observe some lessons and conduct interviews with the teachers and children at the end of the physical education unit. What will the outcomes be? Findings will help us understand how to help teachers use these pedagogies so they can be shared and implemented more widely at the national and international level. Ultimately we hope that meaningful physical activity experiences for children in physical education can positively influence commitment to physical activity participation. To learn more about the project, be sure to follow the LAMPE blog.